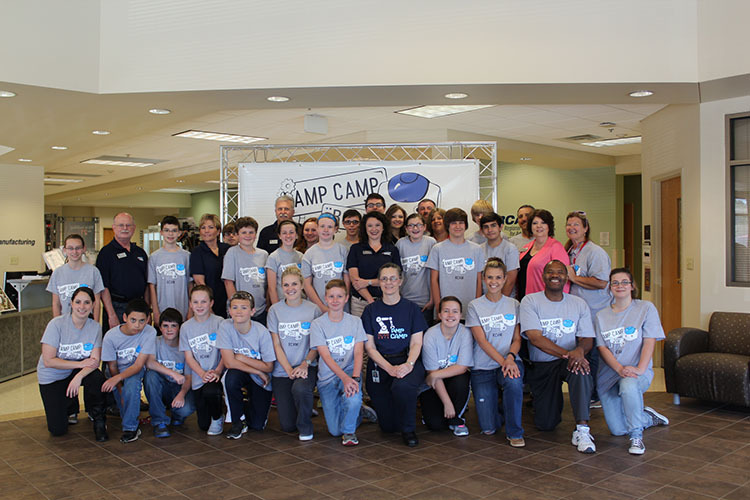 Since 2009, sponsored by the Advanced Manufacturing Partnership (AMP), the Regional Center for Advanced Manufacturing (RCAM) has hosted “AMP CAMP”, a week-long STEM camp targeting upper middle schools students. In the beginning, there were few options for students wishing to explore STEM-related activities. However, this has changed dramatically over the past few years with many K-12 systems and organizations now hosting dynamic STEM camps, career exploration events, and project-based learning opportunities, many of which involve RCAM. We applaud the region for stepping up and owning this vital component of our education and workforce development system. With the increased ownership from the region, RCAM has found the need to shift from a pace-setting role to a support role regarding STEM outreach, primarily due to the increased demand for RCAM leadership in workforce and economic development initiatives such as apprenticeship programs, workforce credentials, and certifications. RCAM will continue to support the region by providing world-class STEM outreach opportunities for students of all ages. Continued emphasis will be placed on project-based learning such as the “Tech-Explorer Catapult Build”, site visits to RCAM showcasing STEM-related careers, and other relevant activities to help educators shape the career pathways of our students. Please know this is not a step back but a step forward in our journey to “Build the 21st-Century Workforce”. The AMP and RCAM are committed to providing engaging opportunities for our students. If your school, organization, or parent association need assistance developing a strategy for engaging students in STEM-related activities, contact the RCAM Programs & Services Coordinator at 423-354-5275 or email rcam@northeaststate.edu to set up an appointment. We feel by providing a robust support structure for STEM-related activities, we will expand the opportunities to reach more students and provide a tool for sustainable engagement moving forward. RCAM is proud to call over 200 students AMP CAMP alumni. This was a major accomplishment, but we look forward to the impact being made on thousands of students as our region continues to own this opportunity.